I’m eating down my pantry, and while the box of Instant Polenta hiding in the back of the cupboard isn’t quite 400 years old, maize was cultivated in Italy beginning in the 16th century. But, the venerable history of corn mush wasn’t quite the motivation – I’m trying to use up those staples that are crowding the pantry as I prepare for the influx of fresh garden vegetables that will soon fill the kitchen. Just to give you an idea of exactly how chock-full of potential my little pantry is I’ve been working though the reserve stock for about three weeks now, consuming grains, rice, pasta and legumes – and haven’t had the need for a single serious supermarket shop. I figure at this point, I’ll be eating pretty well, and spending very little until about the first of June. I predict that instant polenta is “the next big thing,” and will perhaps be bigger than microwave popcorn. Inexpensive, and easy to prepare, it’s the perfect recession food. One batch cooks up in five minutes and yields a substantial amount of corn mush. 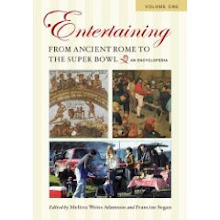 For those of us who are artsy-crafty types, it has the pliable tendencies of modeling clay. Pack the warm mush into a glass pan and pop it into the fridge and within an hour it becomes a sliceable loaf – about twenty meals worth, I’d say. 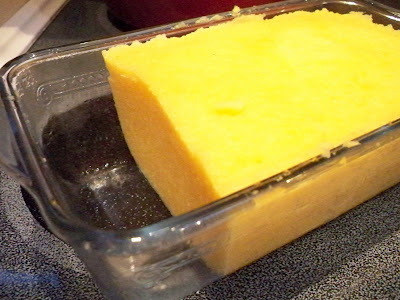 Polenta slices can be layered, stacked or cut into uniform rounds, and fried, baked or grilled. Given a little time, I’m thinking I could even build one of those miniature Christmas Villages. Right now, I’m pumped with polenta – overflowing, in fact. I’m estimating I can get about seven or eight more meals out of this golden brick. I see a few Polenta Ice Cream Sundaes in my future. I've never tried to make Polenta, instant or otherwise. Looks pretty good in your photos, especially with the egg. This week my husband and granddaughter have been building a model of Hogwarts out of cardboard. Perhaps a polenta Hogwarts is in your future! I love polenta and often mix in fresh herbs from the garden. One of my favorite dishes is a polenta, wild mushroom and cheese layered dish, with small polenta star cut-outs on top. It's always a wow when I make it for a dinner party. YUM. I'm very lucky in that I love polenta and Mr. Spy does not. You know what that means: that entire loaf can get in my belly! I really have to try polenta some day. It looks delicious. I love polenta, and it's been on my mental taste buds for days. I just spotted a recipe for polenta croutons that I want to try. It never occurred to me to use a loaf pan! Duh. I'm on alert that my job(with a school district) might get cut. Yikes! Looks like I'll REALLY be eating from my pantry. No matter what, I make it my personal challenge to shop no more than once a week, and to stick to my list. Must be my former "divorced mom days" survival skills. polenta is delicious. YOu can always pan-fry left over and it'll be oh so yummy! love the sound of that polenta and lamb ragu! I adore polenta. I'm so glad that it's becoming more popular. 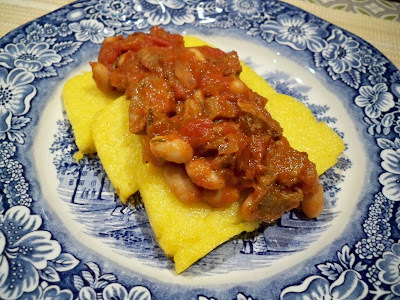 And I just love the idea of your polenta with lamb ragout. How delicious!! I had polenta with roasted root vegetables at one of my favorite restaurants the other night, and it was delicious--a dish that could totally be adapted depending on what veggies are in season! I'm with Lydia and Maryann -- love polenta with mushrooms. In fact, I made some Friday night. Creamy polenta, mix in vegetable stock and tons of grated Parm-Reg cheese; topped with mushrooms (sauteed with onions, butter and red wine). Right, I said "creamy", not "low fat". This CRACKS ME UP! First the "eat down the pantry" - that's what led me to make homemade marshmallows this weekend with rando box of Knox gelatin. I wish I had a box of polenta, but I did find an amazing quantity of crackers .... I wonder what I can crust with mashed up Triscuits or stoned wheat thins .... Good post! 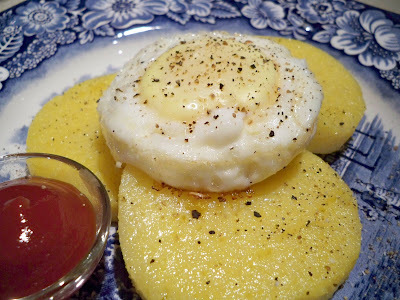 Your polenta looks terrific and so do your photos. 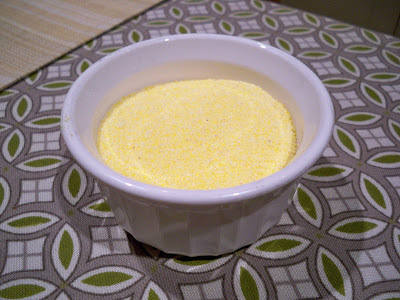 I've never used instant polenta and our grocery store didn't carry it until very recently. I agree with Vernon, it would be very good pan fried as a left-over. 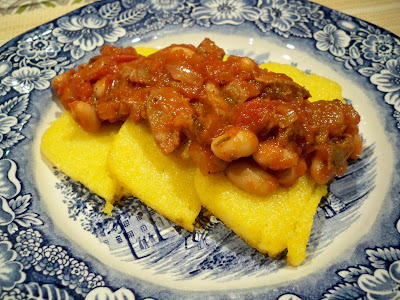 This is my kind of meal~I love polenta with cheese grated over the top....glad to read so many others enjoy it as well!